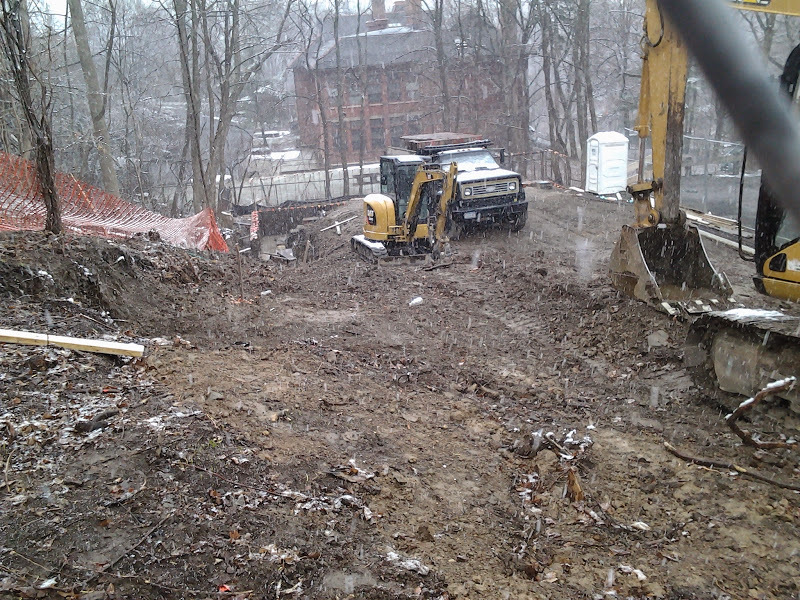 Another infill project is underway in the East Hill Historic District between Downtown and Collegetown. 707 East Seneca, like 202 Eddy Street and 140 College Avenue, had to go through the Ithaca Landmarks Preservation Council for approval, along with getting approval from the planning board and zoning board for an area variance (the lot was too small). After informational and voting meetings by different boards throughout the fall and winter, all the approvals have been granted. The ILPC-approved design is made to be compatible with the historic homes from the late 1800s and early 1900s that surround the building. 707 East Seneca was originally the playground area for the now-closed East Hill School, and the lot was given to the city in 1982. The property fell into disuse, and the playground into disrepair. 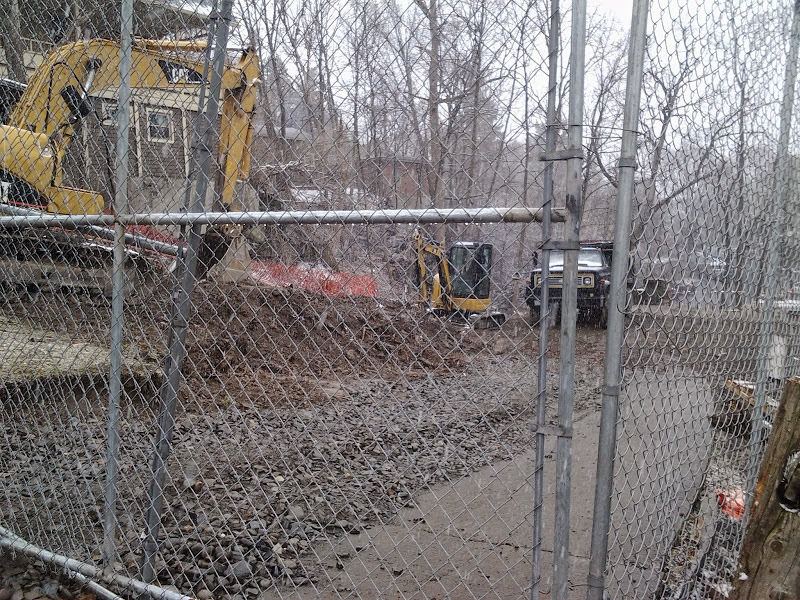 The city voted to put the lot up for sale through the Ithaca Urban Renewal Agency (IURA) last summer, and the lot was sold for $130,000 on December 22nd (the market asking price was $175,000, and the assessed value of the land is $100,000, so the final price looks pretty reasonable). 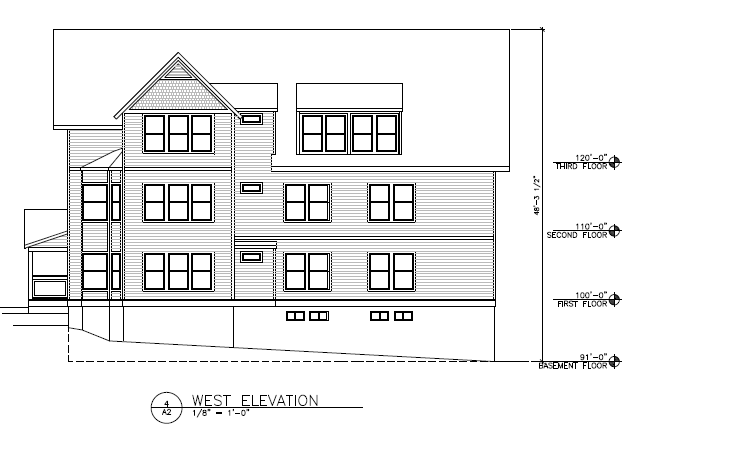 The apartment building planned is a 3-story, 6-unit, 18-bedroom structure with 4 garage parking units in a basement built into the hillside, and five surface parking spaces. According to documents filed with the city, target completion is July of 2015. 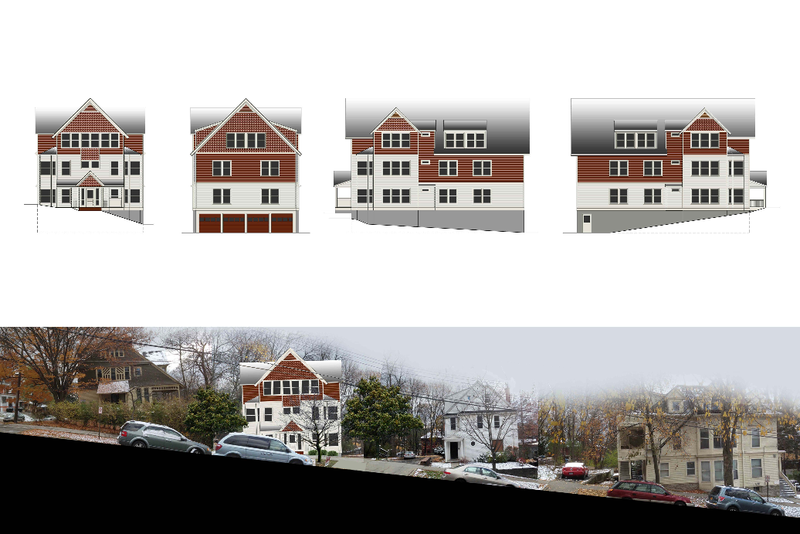 Note for the included renders, the black-and-white image with the small basement windows is the final design, but the colors are the same as the lead rendering. 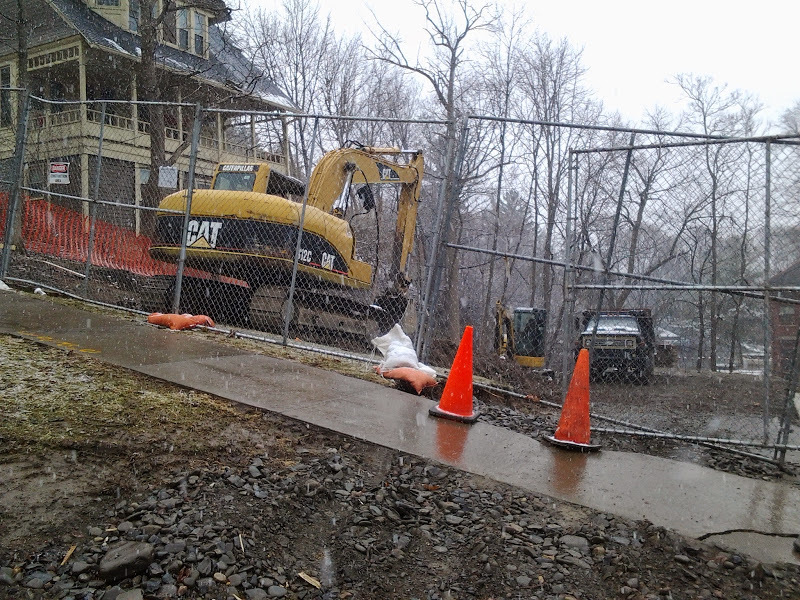 Without getting a good look at the back of the now fenced-off property, it looks like the site has been cleared and excavation is underway for the retaining walls and foundation. Being a sloped site, retaining walls will be built on the west edge of the property (right side of the photos) and for tree wells, and the east portion will use a sloped bank built using fill material. Offhand, I think I remember seeing that the building itself will be assembled from modular pieces, craned into place on the foundation over a day or two, not unlike the method used at the Belle Sherman Cottages. The design of the building is by Schickel Architecture of Ithaca, and the developer is Ithacan Todd Fox.